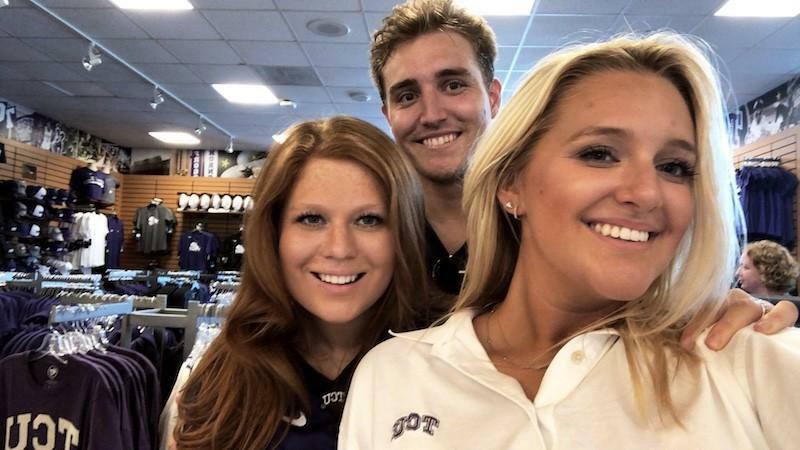 The SMU Mustangs renewed their rivalry with the TCU Horned Frogs on Saturday night in Fort Worth. The teams met for the annual Battle for the Iron Skillet in front of a sellout crowd at Amon G. Carter Stadium. TCU defeated SMU 56-37. SMU won the toss, elected to receive, and got off to a fast start. The Mustangs marched down the field with the help of two TCU penalties and scored on a 2-yard touchdown run by Xavier Jones. The Horned Frogs responded with a quick drive of their own. A 61-yard touchdown pass from quarterback Trevone Boykin to KaVontae Turpin capped of the 47 second drive. 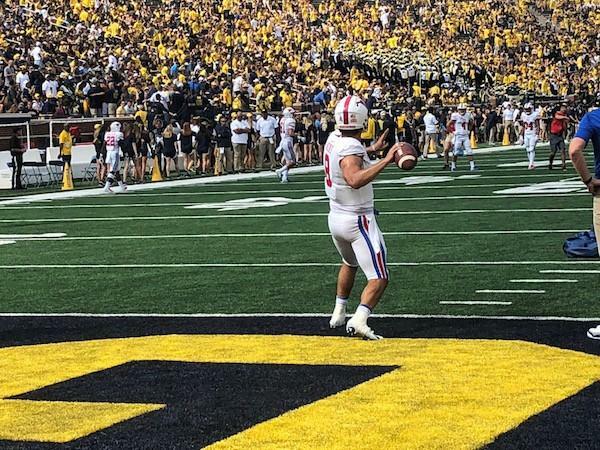 SMU was unfazed, mounting a five and a half minute drive that ended in a 22-yard field goal. The drive included several third and long conversions and put the Mustangs up 10-7. TCU scored quickly again, this time on a 1-yard touchdown run by Aaron Green, making it 14-10 Horned Frogs at the end of the first quarter. SMU’s defense stood tall at the beginning of the second quarter, stopping TCU on fourth and goal from the 1-yard line. The Mustangs were helped by an unnecessary roughness penalty that moved them out from the goal line. Nothing came of the drive despite an unbelievable one-handed catch by wide receiver Courtland Sutton. The Horned Frogs added to their lead with a 29-yard touchdown pass from Boykin to wide receiver Josh Doctson on the ensuing possession. SMU’s next drive was killed by an offensive pass interference penalty and they were forced to punt. A mishandled snap on third down by TCU’s Boykin forced the Horned Frogs to punt it right back. The Mustangs were moving on their next possession but another penalty, this time holding, set them back. They turned it over on downs on the TCU 41, eventually leading to a 20-yard touchdown run by Boykin with 2:01 left in the first half. SMU stayed in the game by responding with a fast 74-yard touchdown drive. The Courtland Sutton touchdown reception was set up with a 63-yard pass down the sideline to Ryheem Malone on the first play of the drive. Big plays and penalties were the story of the first half. The two teams combined for eight plays over 20 yards and 89 total penalty yards. SMU’s defensive backs were unable to stay with TCU’s speed receivers and gave up lot of yards down the middle of the field. TCU started the second half with another quick touchdown drive. 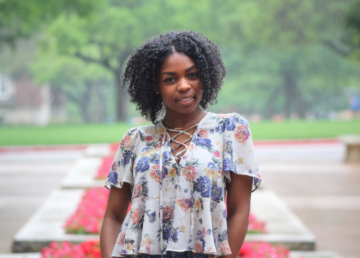 Boykin exploited the SMU secondary for more big plays, finding receiver Kolby Listenbee for a 20-yard reception and then a 31-yard touchdown reception. SMU’s first possession of the half was a three and out. The Horned Frogs continued to take advantage of the SMU defense with a 38-yard pass to Shaun Nixon and then a 19-yard touchdown pass to tight end Dominic Merka, making it 42-17. SMU continued to fight, marching 75-yards on a drive that ended in a touchdown run by quarterback Matt Davis. Defensive back Horace Richardson intercepted Boykin and returned the ball to the TCU 25-yard line. SMU scored three plays later on another Matt Davis touchdown run, making it 42-31. 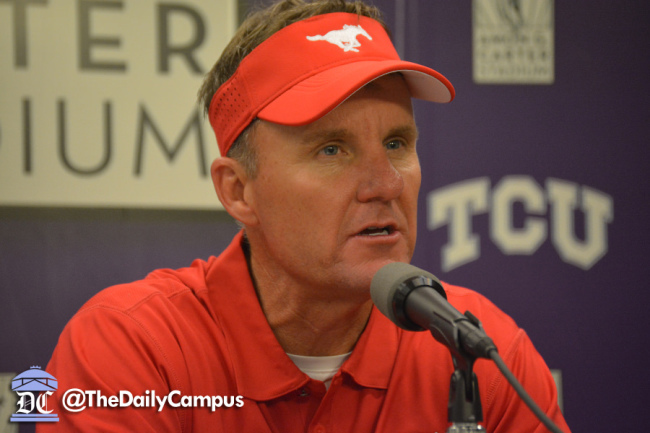 TCU was backed up by several penalties on their next drive and punted it back to the Mustangs. Matt Davis found Courtland Sutton for a 46-yard gain on the first play of the drive, setting up a 21-yard field goal that made it a one possession game and quieted the crowd. TCU looked to be driving but Aaron Green was stopped on a fourth and one carry, returning the ball to the Mustangs. 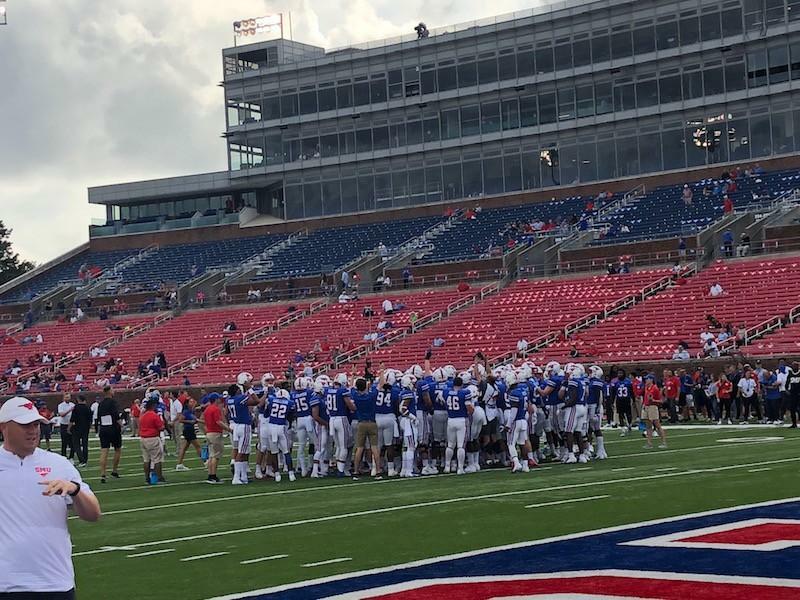 SMU moved into the redzone after another long connection between Davis and Sutton and came away with a 32-yard field goal by Chad Hedlund. The Horned Frogs quickly made it a two possession game again when Boykin found Doctson for 42-yards and another touchdown. It was TCU’s sixth touchdown drive of less than two minutes in the game. SMU came up empty on a fourth and two on their next possession, turning it over on downs. TCU ended any hope of a comeback with a 1-yard touchdown run by Aaron Green that made it 56-37. TCU’s Trevone Boykin led the charge, finishing with 454 yards and five touchdowns through the air to go along with 50 yards and one touchdown on the ground. Running back Aaron Green was also very effective, totaling 164 yards and two touchdowns. Josh Doctson also had two touchdowns, leading the Horned Frogs receivers with 171 yards on five receptions. TCU finished with 720 total yards. Matt Davis led the Mustangs through the air and on the ground, throwing for 330 yards and one touchdown and rushing for 62 yards and two more touchdowns. Courtland Sutton was Davis’ favorite target, racking up 115 yards receiving on just four receptions and scoring a touchdown. He also drew several key pass interference calls on deep plays throughout the game. The Mustangs had 508 total yards. “We were down 42-17, but our guys never gave up. We got a turnover, and we battled right back to score. We also had a couple stops and went down and scored. That was good to see,” said Morris. The game marked the end of SMU’s non-conference schedule this season, one of the most difficult in the nation. TCU remained unbeaten, keeping their national championship hopes alive. TCU will play at Texas Tech next Saturday. The Mustangs will play James Madison at Ford Stadium next weekend in SMU’s homecoming game at 6:00 P.M. CT.